Other Food: daily devos: Who is Jesus? To proclaim the acceptable year of the Lord…. - a good moral example. Here we find out what He thought of himself. The things He said He would do by claiming to be the fulfillment of Isaiah 61:1,2 were only things that Israel’s promised Messiah could do. He clearly claimed to be that Messiah. Of course His hearers, completely familiar with what He had read and savvy as to what His claims implied, were enraged. When He lumped them in with all the prophet-rejecters of the past, their wrath exploded. 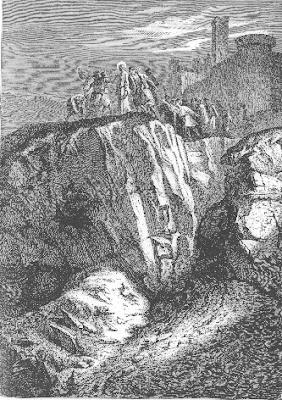 They dragged Jesus out of the synagogue, took Him to a hilltop, and intended to throw him to His death. But it wasn’t His time and He walked away. The reaction of these people to Jesus’ claims about Himself show us that they knew exactly what He was saying. They viewed it as blasphemy. People who refuse to accept Jesus’ claims as God, yet insist He was a noble character must not have read passages like this. For it’s clear that either Jesus was who He clamed to be or something far less honorable – a liar perhaps, or deluded, or mentally ill? - how we come to God (John 14:6). - the fate of those who believe in Him (John 11:25-26). - the fate of those who don’t (John 3:16-18). Who do you think Jesus was? Why do you believe the way you do? Has it made any difference in the way you live? PRAYER: Dear God, please show me who Jesus is. And may it be more than just an intellectual knowing. Amen. MORE: Other answers to "Who is Jesus?" C. S. Lewis’s statement ‘refuted’ – are you swayed?